Been a bit down on cycling of late. Fairly sure I'm still keen on it, just my planets are not aligned right now. We went to Reculver the other day - daughter had a photography project to do, and this seemed like an excuse for a day out. 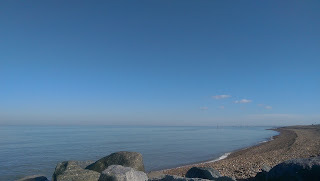 Reculver looking out at Margate. Sod it; solo to the café it is. Inspired by the Reculver cyclists I dug my PACE RC303 out again. 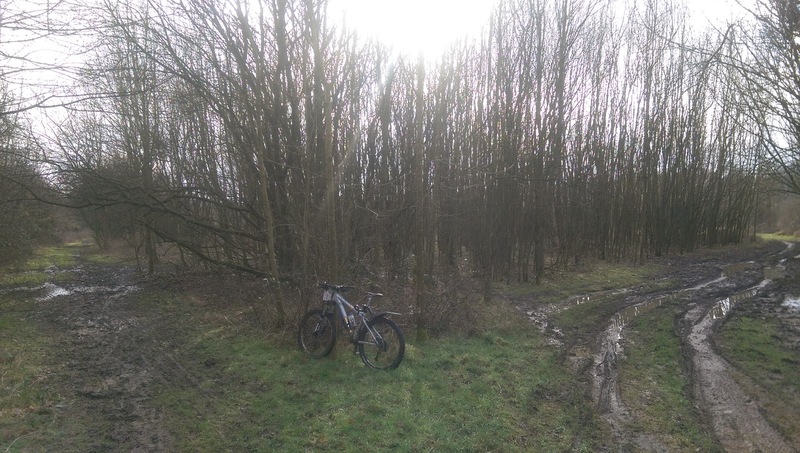 Would have taken the fat bike, yet it was buried behind other bikes. The PACE is an original long travel hardtail, running 26" tubeless. May I add that's tubeless tyres from Decathlon, less than £35 a pair for quality Michelin tyres. Really. A pair, new. You kind of have to shop around for 26" stuff now. I have a rule; see it, buy it! I've tried a 650b. It was OK. It didn't make me desperate to change. It was one of the early models though; 2.25" wide tyres. Just felt taller. I'd actually be interested in trying a proper, boost one on 2.6" or 2.8" tyres. My suspicion being 2.6" may well be a sweet spot. I'm not totally convinced things have settled down in the world of mountain biking. Dartmoor seem to have moved away from Boost. All I do is ride to places. I'm in my 50's. I've broken my collarbone, three ribs, crushed my other shoulder, had concussion, onset of exposure twice, and countless cuts and bruises from cycling over the past two decades. Three trips to A&E. My right collarbone happily dislocates itself at one end now. These days I'm content to arrive home without my wife deciding that just perhaps I should go to hospital. I'm fairly confident all my injuries will result in some older nasties emerging as I approach my 60's. My pleasure now, as I guess it always has, comes from finding things. Things that are increasingly coffee, cake or beer related. I'm content to cycle out for an hour or so, find a great café or pub, then bimble back. Around Surrey the full day trips hold no real interest anymore. Neither do indifferent cafes. Why eat something boring? There's hardly any difference in price between indifferent and good food, certainly not here in Surrey. Nescafe instant at the hut on Epsom Downs for a couple of quid in a polystyrene cup, or find a warm little café serving quality, freshly ground roast for just 25p more? And if that hour out involves mud, so much the better. 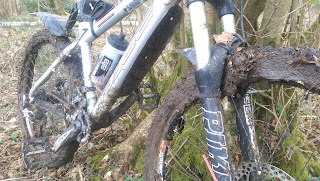 26" may be dead, and I can accept that, but narrow tyres are so brilliant in the slop. Just watch a cyclocross bike one day. 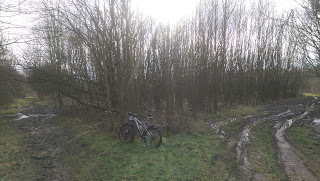 My fat bike is awful in the gloop, unless it is that semi frozen, almost solid stuff we get. And now we stop the forward motion. Just in case you think I've lost it, which I probably have, I've booked 6 days cycling holiday in Minehead.